TATS A KOOL CHALLENGE: Chinese Dragon! Way back in 2009 I tatted Anne Bruvold's Chinese Dragon having see the beauties that others were showing. Haven't had the chance to show you before now and today seemed appropriate. My first attempt was in Altin Basak in an olive green with Rainbow Ruby beads. 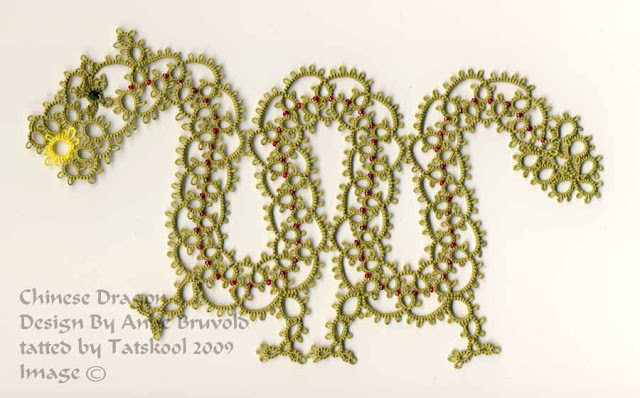 It was quite hard to manage as you tat all the way along to the tail before coming back and joining to the first side all the way to the head....I had all the long length of tatting twisting and flopping around. It wasn't until I tatted it again in a firmer thread that I realised how much the solftness of the thread had made it so much more unmanageable. I wanted a bead for an eye but didn't have the patience at the time to try to work out how to do that so am sewing one on afterwards. The pattern is very very well written, but I still enlarged the diagram and coloured every bit in as I went along to make sure I knew where I was. The second attempt was to be my piece de resistance in my own thread, Raspberry and Chocolate Mousse. This is a favourite thread as I like the subtle colour change. However, despite colouring in every ring and every chain on my diagram when I got to the neck I was a ring and chain out!! I checked every bit of my tatting and blow it but I couldn't find where I had made the mistake. Isn't that funny, I can see as clearly as anything that the mistake is in the first loop of the body, but I can't pin point exactly where it is. So forget it and live with it, it's just a rather differently postured dragon! I did have to add an extra ring and chain in the neck so he has a longer neck and a slightly more bowed head! Little gold beads twinkle throughout the body. This thread was so easy to tat with, I am so pleased. In size 30 the dragons measure 21cm. Sh 1 approx 15.75m, Sh2 Approx 13m. Would love to tat one like Tattycat did holding a pearl bead in it's mouth. The chinese dragons are absolutely gorgeous, you did a wonderful job! It's really beautiful! When I pointed out mistakes in my work to my grandpa he'd always say, Ah, a blind man would be glad to see it!" You've inspired me to try to make one for my son- he has studied a lot of dragon lore. Absoulutly brilliant just love the colours,your work is a piece of art!!!! They're really striking, very impressive. Somehow the Raspberry dragon looks a lot more fierce than the olive green one! - He seems to be firmly putting his best foot forward - marching off with purpose. I think it's becasue he doesn't have an eye! Beautiful. Your tatting is so lovely. I am not usually a dragon person, but those make me want to make one or two or three....I know my nephew would love one for a bookmark. Both dragons are fierce and fiery and fun! I think your next dragon should be done in blue with iridescent peacock-colored beads. No, wait! Have you tried Rainbow Bright? The Raspberry and Chocolate Mousse really does look divine, so perhaps it is a sign to stick to subtle variegations. Such beautiful chinese dragons. Both look stunning!! I like them in both colours, don't look for mistakes unless pointed out - we can't all be perfect!!! Both are wonderful! Your work is always so stunning, it makes me think "I want to make that too." I keep coming back and looking at this. I just love it, but it is a big undertaking.... I think I am going to have to try it very soon, as I am spending far too much time drooling over this page! Thanks Everyone, sorry that it i did not get time to reply to them individually. It was a big undertaking, a lot of it tatted on a train journey. take it in small doses, colour in the diagram as you go and it will soon be finshed. Irridescent peacock coloured beads sounds wonderful.